If you're bored with sushi and sick of ceviche but still crave the taste of raw fish, prepare to pile in for the latest pescatarian food craze: poke. Hailing from Hawaii, poke—pronounced 'poh-kay'—is a colorful mix of raw cubes of fish (often tuna) with a soy-based dressing, served in a bowl with rice and garnishes. 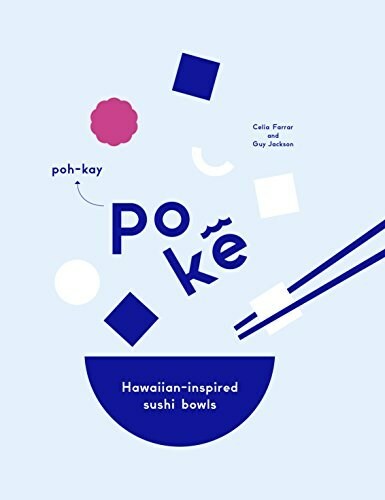 Anything goes when it comes to ingredients, and in The Hawaiian-inspired Poke Cookbook you will learn how to create your own bowls of goodness. You simply select your base of choice (rice, salad, slaw), pick your poke (salmon, tuna, tofu), then pimp it up with a zingy or fruity dressing and/or pickle. Easy! The possibilities are endless, but the results are always flavorful. Traditionally made with raw fish, poke can even be adapted for vegetarians using delicious marinated mushrooms or beets, or silken tofu. You'll also find recipes for different toppings, vinegars, dressings, pickles, grains, and even sweet poke varieties.